Besides the amazing architectural highlights, Barcelona offers a wide range of typical Catalan cultural events from which the correfoc in my opinion is one of the most spectacular. 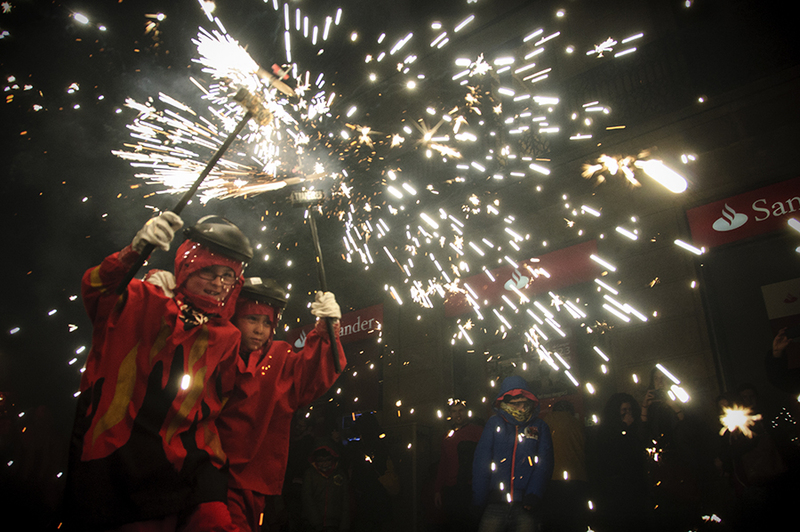 So to start off, what is a Correfoc…? 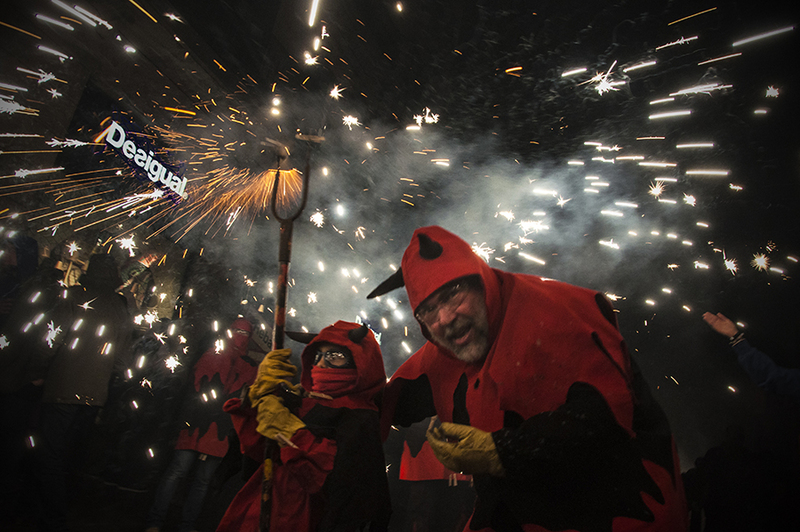 A Correfoc is literally a “fire-run” in which a group of individuals, mostly from the local neighborhood will dress as devils and will light fireworks fixed on devil’s pitchforks. They set off their fireworks among the spectators to create a spectacular atmosphere of light and fire. 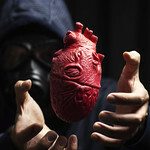 It is originating from the Catalan folklore and represents the duel between good and evil. 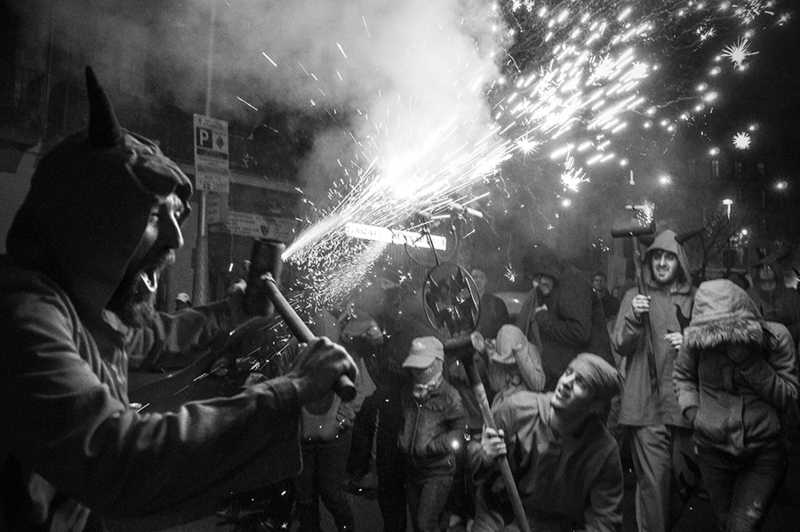 During the year most barrios have their annual festivals that traditionally end with the correfoc and the end of September the city host La Mercè which is the major festival for the entire city. 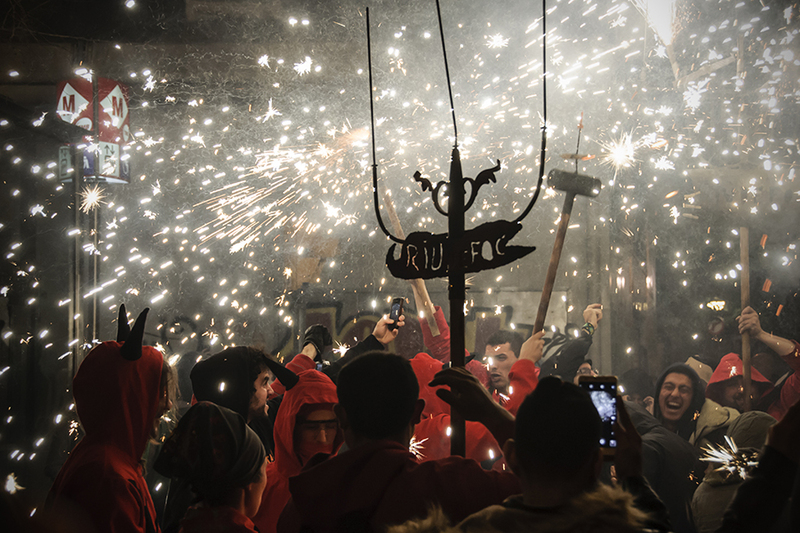 It might sound a bit odd to write a blog post for a future event, but in this blog I would like to give some practical insights of taking pictures at the correfoc of La Mercè and capture some jaw-dropping pictures. PICTURE NOT GOOD? I GUESS YOU ARE NOT STANDING CLOSE ENOUGH! 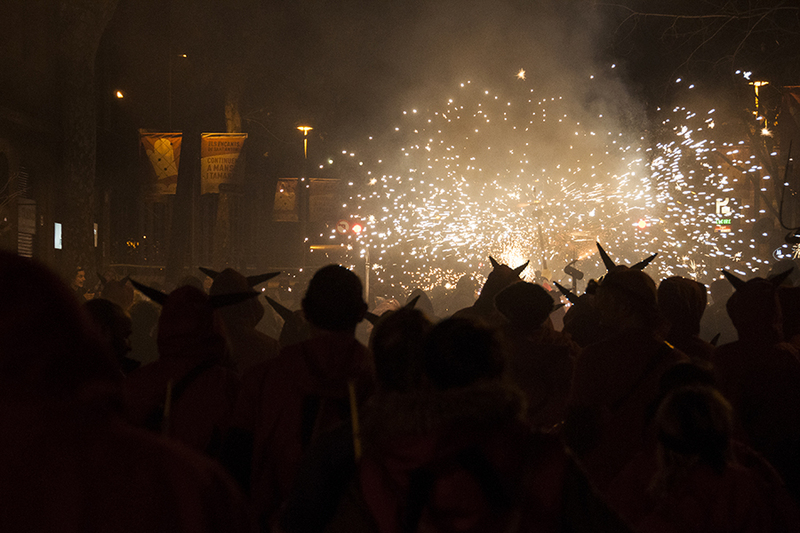 The event of the correfoc is not without dangers, so the audience should keep a safe distance from the participants and wear protective clothes against small burns. But for some reason keeping a safe distance and taking great pictures just do not go together. Like a war photographer who puts himself at risk to create the most appealing photos you have to be in the line of fire to be close to the fire or even better… jump underneath the fire. It is wise to wear protective clothes like (sun)glasses a sweat shirt, despite the heat, preferably with a hood to protect against firework falling from above. 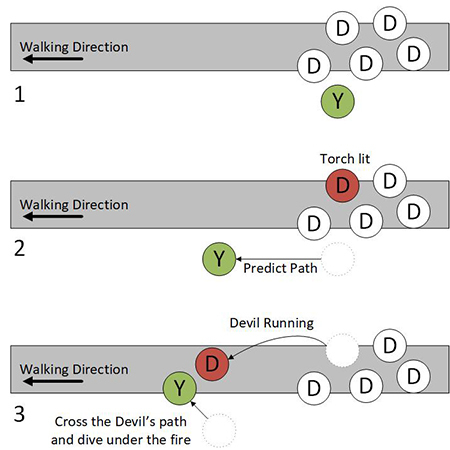 On the moment you see a devil-figure light the torch  you run 10 meters upfront while keeping track of the devil-figure, who starts running when the fireworks are burning. 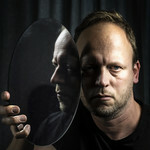 For the perfect picture you determine the crossing point  and in that specific split second you make amazing pictures. Because of the speed of the event you will most probably repeat this procedure multiple times. Besides all preparations there is a factor of just having luck. Now the technical part, how do you adjust your camera in this low-light and high-speed conditions? Well if you have a modern full frame camera you have an advantage, but mid-class cameras are quite fine as well. Just put everything on Manual, take an example picture and check if these camera parameters fit your needs. So you set the ISO to the highest value that your camera can take proper pictures with (ISO around 800-1600). The shutter speed is an interesting setting at correfocs, because it will determine the length of the firework particle stripes. If you have a very small shutter speed (1/500s) the fireworks will look like white snow. However if you use a longer shutter speed (1/80s) you will see longer light stripes that will intensify the effect of the fireworks. For white balance I would say, trust PhotoShop. 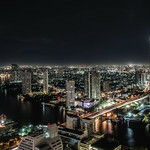 The Aperture should be the smallest value that creates decent pictures with low light, for example f/9. When you take pictures from below the devil-figures your camera should be almost near the floor. This means you will not be looking through the camera as your are taking the picture. It can be useful to practice some of these shots to have more luck at the correfoc event itself. When you select a street to take the correfoc picture be sure that there is no big Desigual logo or other non-related light object in the picture. Final thing: if it rains, they cancel it, too dangerous. (haven’t found the logics in that one yet 🙂 ) So this year’s correfoc at La Marcè on Saturday or Sunday in Via Laietana around 20:00. Check the exact agenda before going. Happy shooting! We are on FlickR too!